Pope Francis is now three years into his pontificate. He is a popular pope, but there are Catholics who believe his popularity has come at a cost. After many of his extemporaneous remarks as well as some of his more deliberate pronouncements, he has been roundly criticized for avoiding clarity and arguably even undermining Catholic doctrine, as though he views Catholic teachings as simply too much for people to accept and thinks that the nice thing to do is to blur or ignore some teachings and doctrines to make Catholicism more palatable for those he wants to win over. These criticisms have been consistently expressed by prominent Catholic thinkers and are widely available. Even if one has not followed these controversies, surely there have been enough examples of weakness and failure on the part of other bishops, in various contexts, to abundantly illustrate that the successors of the Twelve Apostles are just as subject to human weaknesses and failings as the originals. Now as always the Church seeks ways to respond in accord with God’s will. It seems to make perfect sense to frame a response around a favorite theme of Pope Francis himself, that being mercy. This is the pope who chose the motto, Miserando atque Eligendo (Having Mercy on Him and Choosing Him), recalling the mercy Jesus showed St Matthew, who though a sinful man was lovingly chosen and called by Jesus. This is the pope who inaugurated the Jubilee Year of Mercy. While Pope Francis has often asked the faithful to pray for him, he has never asked for their mercy. That’s not a thing most Catholics now-a-days have a whole lot of familiarity with – having mercy on a bishop, especially if that bishop is the pope. Part One of this paper will consider principles of mercy in relation to our bishops. Part Two will consider some practical applications of mercy in this circumstance. It is helpful to begin by recognizing that the Catholic Church is a family. It is second nature for Catholics to speak of the Church in familial terms, calling ourselves sons and daughters of the Church, brothers and sisters in Christ, and so on. As a child, my family was home. It was a place of relationship where I was unconditionally loved and valued, a place of peace and solace where I was protected and nurtured, a medium for my thriving in the world. Above all, it was a place where I learned trust and faith. Now as an adult I still need all these things no less than I did as a child, for I still am a child, only now I know it. The Church as family and home provides me with all these things. Families have dads. There are lots of references to Jesus as groom to his bride the Church, none more wonderful than St Paul’s Letter to the Ephesians, where he recalls the language from Genesis about the one-flesh union between husband and wife being deeply and mysteriously related to Christ and the Church. Jesus gave to the Twelve and their successors a fatherly, episcopal office with a sacred power to act in his stead, in persona Christi Capitis, in heading his Church. The ring a bishop wears symbolizes his self-gift in marriage to the Church in imitation of Christ. It’s easy to get preoccupied with episcopal authority in terms of power, and indeed the office does include authority of governance. But dads are more than just wielders authority, and so too are bishops. They are a foundation that holds the rest of the family together. In nuclear families dads in their complementary roles are protectors and points of unity, facilitating family harmony and cohesion, the very things Jesus prayed for in his Church. Bishops are all about Church unity, functioning as they do in fraternal unity with one another for the sake of unity of the whole Church. And like dads, bishops are given over to sacrificial service, imaging Jesus who completely gave himself away for us so we could be made one and holy – sharers in the divine life. Put all this on steroids and you have the Petrine Office, the papacy. The pope’s authority is enormous. The rest of the bishops can’t govern without his approval and recognition (CCC 833-884), but he can govern without theirs (CCC882). And regarding his episcopal role as Vicar of Christ and pastor of the entire Church in preserving unity in the Church, “The Pope, Bishop of Rome and Peter’s successor, ‘is the perpetual and visible source and foundation of the unity both of the bishops and of the whole company of the faithful.’” (CCC 882) In teaching the faith, the Pope is the only bishop whose teachings are infallible irrespective of the concurrence of the rest of the bishops. “The Roman Pontiff, head of the college of bishops, enjoys this infallibility in virtue of his office, when, as supreme pastor and teacher of all the faithful – who confirms his brethren in the faith – he proclaims by a definitive act a doctrine pertaining to faith or morals…” (CCC 891) In terms of his sacrificial role, the red shoes traditionally worn by most popes through history say it all, for they symbolize the blood of Catholic martyrs. Dads and popes mess up sometimes. It’s hard to see a father’s weakness. To young children, dads seem infallible, and for a period in their lives that provides them with a certain sense of security. There was a story about a six year old boy who was lost in the rubble of an earthquake in Armenia in 1989. It was a devastating earthquake in which tens of thousands died. His dad went to search at his son’s school, which he found leveled. He began digging desperately through the rubble. He kept digging long after other rescue workers had called off work at the site of the school. He dug for over 36 hours in the devastated ruins – and against all odds found his son still alive. The boy later said he had known all along that his father would find him. This is the faith of a child in his dad. We look to the Petrine Office in the same way. We trust. Jesus made us these promises. It can be pretty unsettling when we realize dad isn’t all we thought he was. We wake one day to discover he has weaknesses we would rather not have known about. Some of us have dads with out-of-control tempers. Some of us have dads who drink too much. Some of us have dads who are unfaithful. Catholics must allow for human frailties in our popes too. A pope can even make mistakes in what he says and writes, for we know that not all his pronouncements are protected from error by his charism of infallibility, but only those he proclaims by a definitive act as a doctrine pertaining to faith or morals. Pope Francis is the first to admit his own weaknesses. 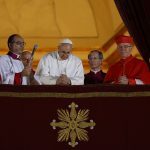 Never the less, if a pope says things that cause confusion or are difficult to reconcile with settled doctrine, some consternation among the faithful is inevitable. Trust is undermined. “I thought you had my back.” There might even be some sense of betrayal and blame, leaving the fraternal relationship damaged. Our faith recognizes that these dynamics play out in our immediate families and in our Church family. But the story doesn’t end in estrangement. The Church searches until she finds us in the rubble and then moves us from fractured disunion back again toward healing and unity. The Catechism calls mercy a fruit of love. (CCC 1829) It is not love itself but something that arises out of love, agape-willing-the-good-of-the-other love. Mercy is love’s response to another’s brokenness as seen in his infirmity or in his sin. Mercy is seeing fallen and suffering man through the eyes of this love. It moves from the compassion in our hearts to a desire to act, to help the other. What is most profound about mercy is that, as with love itself, the more one gives the more one gets. In Dives in Misericordia, Pope Saint John Paul II said that mercy has a reciprocal dimension: the person extending mercy to another is also receiving something back. Again, authentic mercy involves seeing another person through the eyes of agape love, that is, as God sees him. Jesus was pretty plain in telling us that when we see another person in his brokenness we are looking right at Jesus himself (Matt 25:31ff). Jesus sees you and me as members of his own Mystical Body. If we look at Pope Francis that way we should see Christ. Jesus also made it clear that when we are merciful to Pope Francis, Jesus himself is receiving our mercy (you did it to me). Therefore every extension of myself in mercy is a discovery of Christ in the other. It is also entering into an intimate relationship of loving mercy with Christ in the other. This closeness to Jesus is our deepest longing, to know and love him more fully. In that way mercy is indeed reciprocal and not a bad trade at that. I give mercy; I get God, complete with all his love and mercy for me. Mercy is a subject that can lead to a vast array and depth of insight, but the scope of this paper permits only a few more thoughts. William Shakespeare penned the famous line in Merchant of Venice, “The quality of mercy is not strained.” What this means is that mercy cannot be constrained, that is, forced. Like the love from which it springs, mercy must be freely given or it’s not mercy. Mercy is not stingy. It is generous, opulent. It is not measured or meted out but lavished. Mercy is in a word free, though this is not to say that it is cheap or that it allows a blithe dismissal of evil. After all, God is the source of all mercy, and he paid dearly for it with the passion and death of his beloved Son. As we receive and give with magnanimity this commodity of God’s mercy, it is good remember and say thanks for the price it was bought for. Shortly before his election to the papacy, Cardinal Ratzinger gave a homily in which he said the following. Christ’s mercy is not a grace that comes cheap, nor does it imply the trivialization of evil. Christ carries the full weight of evil and all its destructive force in his body and in his soul. He burns and transforms evil in suffering, in the fire of his suffering love. The day of vindication and the year of favour converge in the Paschal Mystery, in the dead and Risen Christ. This is the vengeance of God: he himself suffers for us, in the person of his Son. The more deeply stirred we are by the Lord’s mercy, the greater the solidarity we feel with his suffering – and we become willing to complete in our own flesh “what is lacking in the afflictions of Christ” (Col 1: 24). In his Letter to the Ephesians, St. Paul talked about the love and mercy of God. “And you he made alive, when you were dead through the trespasses and sins in which you once walked, following the course of this world… But God, who is rich in mercy, out of the great love with which he loved us, even when we were dead through our trespasses, made us alive together with Christ (by grace you have been saved), and raised us up with him, and made us sit with him in the heavenly places in Christ Jesus.” (Eph 1:2 ff) (Emphasis Added) St Paul’s words ought to inspire a largess, a disposition to loving compassion for Pope Francis, who bears the great weight of being Vicar of Christ in a world marred by enormous pride, deceit, hatred, violence, and cruelty. In this Year of Mercy the way is open. But the question what that extension of mercy toward the pope actually looks like in practice remains to be explored. That will be the topic in Part Two of this paper. Junto Action Items: Consider what mercy is and how it moves within us.